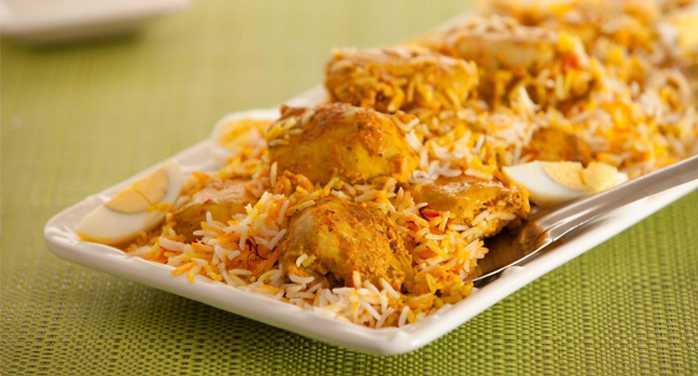 Enjoy the pure bliss of Hyderabadi Dum Biryani by following this recipe. You need to marinade the chicken for a delicious taste. The rice are boiled then layers are done by following chicken, rice and vegetables. Colorful biryani has a marvelous taste. Serve it with raita. Fry the onion until they are golden brown. Spread the onions on a kitchen towel. Prepare the marinade add chicken pieces to the cooking pot with yogurt, ginger garlic paste, salt, red chili powder, turmeric, cumin powder, coriander powder, green cardamom powder, garam masala powder, lemon juice and whole green chilies, 4 tbs desi ghee. Mix well and marinade for at least 30 minutes. In meanwhile in a cooking pot add water with salt and bring it to boil. In a cheese cloth put cinnamon stick, bay leaves, green cardamoms, black cardamom, cloves, black pepper and star anise and tie it and add this bag of whole spices to the boiling water. Add rice to the boiling water and boil them until they are ¾ done. Drain the water and keep aside. Turn off the heat and place the marinaded chicken pot next to the rice pot while using the straining spatula put a layer of rice on chicken. And on this layer add some brown onions, fresh chopped cilantro, fresh mint leaves, green cardamom powder and add another layer of rice on top of it. Garnish the second layer with brown onions, cilantro, mint leaves, green cardamom powder, garam masala powder. 2-3 tbs of desi ghee and food color or saffron soaked in milk. Seal the pot with chapati dough. Keep it on high heat for 10-15 minutes and then on very low heat for about 10-12 minutes (at this point you can place a heat spreader or tawa under the cooking pan) until you see the steam coming out of the edges of pot. Discard the whole spice bag when the rice are ¾ done. You can strain the rice in a colander too.